When was the last time you looked at the food item in your hand from a vending machine or micro market and wondered where it came from? When was the last time you were intentional with the food you ate, taking time to assess labels, ingredients, and actual taste? 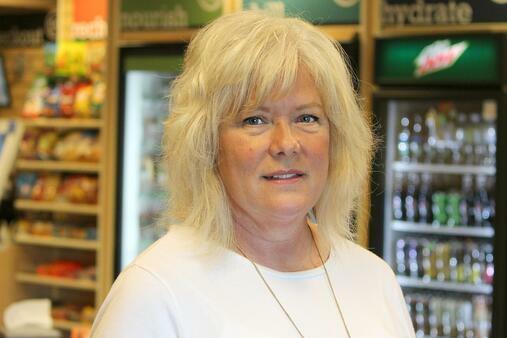 Those elements of prepared food are becoming more and more commonplace for today's consumers and here at Bernick's, we have someone who lives, breathes, and (literally) eats culinary innovation: Cynthia Lind. The rate of change in the food industry is high. Think about your favorite restaurant for example. Can you remember a time your beloved go-to menu item changed or was removed entirely from the offerings? What about coffeehouses that rotate seasonal specialties to drive consumer engagement? These are both indications of how much change and innovation goes into the food and beverage industry. As a provider of service and products to over 2 million consumers, we have an obligation and honor to provide the best of both. Two years ago, we looked at our team of dedicated experts to identify where we could bolster efforts to better serve our customers and consumers. We added Cynthia into the mix as our culinary innovation specialist. She came to our food service sales team with over 35 years of food service experience including brand specialist and sales manager. She's a well-rounded, passionate, and knowledgeable individual who concentrates on the types of food we supply and how to be the best at it. If you ask Cynthia why she's here, she'll tell you it's to manage the ever-changing landscape of food service. She'll also let you in on her superpower. "Bernick's had an opportunity to add someone with an acute food sense, and that person is me," she said. She's tasked with managing what's trending in food and the demographics that consume it. She works closely with our food sources and suppliers including a local caterer who help develop our menu offerings for our vending and micro market products. Cynthia said, "I probably make our caterers a little crazy, but I mean well. I want every salad, sandwich, and packaged food item to provide the best dining experience for consumers, each time they enjoy an EATS brand. I'm a sauce person and firmly believe each and every sandwich deserves its own sauce. Yet, providing a fresh experience from a vending machine or micro market requires a little more creativity." Cynthia worked with our catering partner to add a side of sauce - like mayo or BBQ-based sauces - to specific sandwichs in a pre-portioned side cup. This change might seem subtle, but its impact is huge in the marketplace. Consumers and our customers who provide these food items to them have come to rely on our team to provide the best experience, each and every time. And, Cynthia is leading the charge. As someone with nearly four decades of food service to their name, you can say Cynthia is a bit of a foodie. That might be an understatement now that I mention it! She's immersed in research and development, continually thinking of ways to make our food service offerings better. She keeps a running list of ideas to flesh out, often leading new innovations with a single name. What does that mean? Sometimes it starts with a single ingredient, like a bun, a protein, or a certain cheese, and sometimes we start with a name, and work backwards. Cynthia said, "I'll often have an idea for a new sandwich or salad and an idea for a name will pop into my head. Like right now, I have Tavern Burger running through my head, so it's on the list. I don't know what a Tavern Burger is yet, or how we can offer it up to consumers, but it's a work in progress. Like any creative process, it's an evolution." One of the first big initiatives Cynthia was tasked with after joining Bernick's was leading the way on rebranding our fresh food line. Consumers are faced with nearly endless options when perusing vending machines or micro markets, and we needed a way to cut through the clutter of that landscape. She worked with our creative teams conceptualizing EATS - Enjoyable And Tasty Selections - to develop a new look and feel of locally, fresh-made food items as well as curating a new menu to bear the rebooted labels. Look for more information in an EATS-based blog next month. It's no secret Cynthia has a private mini-fridge near her desk full of test subjects - new items and offerings she's in the process of tasting and vetting for future introduction to the marketplace. I recently asked her as the ultimate purveyor of food what her favorite food of all time is, and she immediately answered. "Sauces. I believe in the holy power a well-prepared meal can take on when enhanced with a flavorful sauce. I'm passionate about layered flavors and textures. I loved all things braised, like Coq Au Vin (a French dish of chicken in a rich wine sauce). The future of food service looks bright - I should say delicious - with Cynthia's addition to our dynamic team. This world changes fast and moves at quite the clip. We look forward to further alignment on all things food innovation and eating up all the wonderful things Cynthia and team serve us.